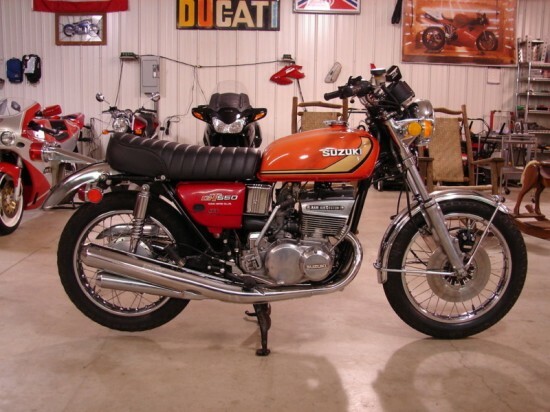 For those of you that frequently check into our sister site RSBFS, you might notice the garage where this 1974 Suzuki GT550 is pictured. Names like Ducati 900ss, Bimoto, and other exotics have been photographed and sold out of what appears to be the same garage. So how did a lowly 550cc two stroke come from the same stable? The condition appears to be as it would have been in 1974. 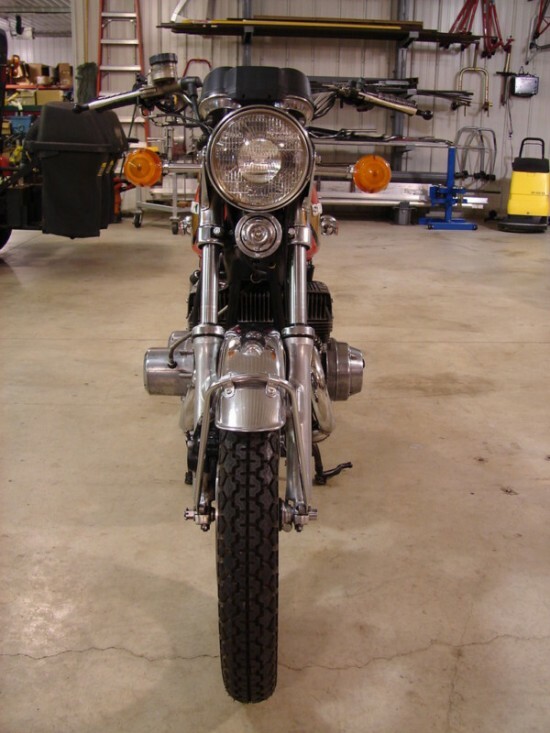 The chrome on this bike is in great condition! The headlight ears have very light pitting on the surface. 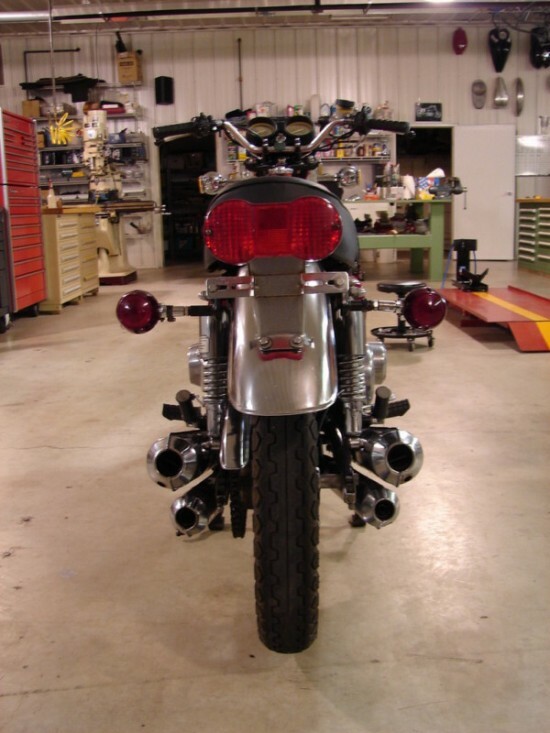 The exhaust pipes & Mufflers are solid with no soft spots or dents. The tank and fenders do not have any dents. The paint is also nice but the paint on the tank has faded on the top portion. The engine and covers look great. The wheel rims are nice with no pitting on the chrome. All of the mechanical and electronics work good (even the neat digital gear indicator display). 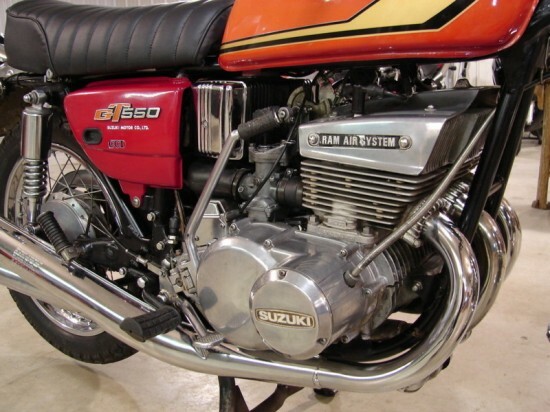 When Suzuki first offered the GT550 in 1971 people wanted to compare it to the competing Kawasaki H1. But where the H1 was sold in wild colors, the GT550 was targeted as a touring machine. With 53hp at 7300 rpm, this 4 pipe 2-stroke could be confused with a sport bike. But with a long wheel base and a 120 degree crank, the power came on strong and steady, not peaking like a scalded cat. The condition of the bike is great and runs, starts and shifts very well. A good 2 stroke mechanic recently rebuilt the top end with new genuine Suzuki parts (rings, gaskets, bearings, cylinder hone). The mechanic also installed a new starter motor clutch. Both tires are also new. The seat is a new reproduction recover and looks great but it was not a professional seat recover job. When I was scanning bikes this morning, what caught my I was not the bike, but where it was pictures. But then I wondered why someone who has owned Ducati’s s and Bimoto, would own a 1974 Suzuki GT550. Seeing the pictures posted, and reading how the Suzuki combined 2 Stroke power, and called it a tourer, I realized that everyone needs a rider. Being hunched over and racing at insane speeds, has its benefits. But cruising on a classic also has its place in life. I’ve always had a soft spot for the GT550. Neat bikes, and this one looks about as perfect as you could ever hope to find. The GT 550 Indianapolis. Second year of production, first year with a disk brake up front. A real Grand Tourer. Smooth and fast. Handling was reasonable. It had a digital display between the clocks that told which gear you were in. 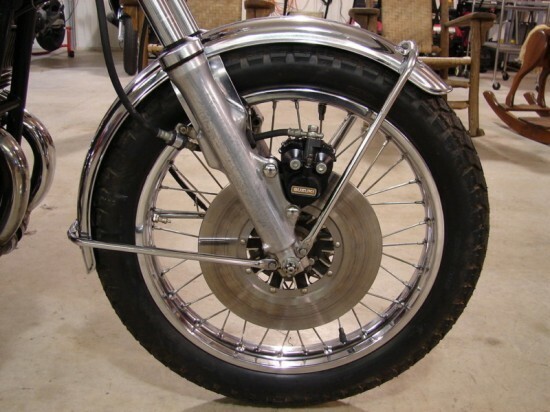 Because there was a wealth of low end torque, you could even run it with a sidecar (I did for 2 years). A bike with true character. Something lacking in most show rooms today.